Unknown armed men have ambushed three buses and killed at least 22 Shia Muslims in northern Pakistan. Reports say gunmen forced passengers off the buses and checked their ID’s before shooting 22 Shia Muslims to death. Some reports say Pakistani Taliban militants were responsible for the attack. The recent rise in terrorist attacks against Pakistani Shia Muslims has caused international outrage with many rights groups and regional countries expressing their concern. Shia Muslims in Bahrain hitting their chests during the time of Muharram in remembrance of the hardships Hussein ibn Ali went through. The United Nations Secretary-General Ban Ki-moon today expressed strong condemnation of the deadly attack in north-western Pakistan. Mr. Ban has expressed his outrage over such deliberate attacks on people due to their religious beliefs in Pakistan. He extends his heartfelt condolences to the families of the victims and to the Government and people of Pakistan. Reports say for the past three years, militants have killed a large group of Shia Muslims by targeting their buses. 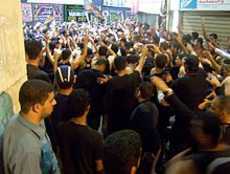 In addition, thousands of Shia Muslims reportedly have been killed in several parts of the insurgence-hit country. Reports say Pakistan is notorious in the world for patronising and nurturing terrorism, has today itself become prey to it, particularly the Taliban militants. The Taliban were associated with fear, terror, torture and inhuman activities on Pakistani soil. In December 2011, a suicide bomber in a vehicle loaded with explosives attacked a Frontier Corps camp located in Northwestern Pakistan, killing at least nine soldiers. The attacked also also injured an additional 17 soldiers. Sources said nearly 300 paramilitary troopers were living in the camp, which had several residential barracks. The 17 soldiers injured in the attack were taken to a military hospital in Bannu. The attack targeted the troops to avenge the killing of the Taliban commander, Taj Gul in a recent U.S. drone attack in South Waziristan.